Have you got ugly stretch marks that you don’t want anyone to see? Or you’re pregnant and expect to have them soon enough? You needn’t resolve yourself to dressing in ways that hide those marks. Instead, minimize the appearance with homemade creams. Stretch marks are defined as thin lines, stripes or streaks that appear on the skin’s surface when it’s been overstretched and fails to regain its normal form. It is a common skin issue that is more prevalent in women. Although generally not discomforting, these bands of parallel lines may feel sore or itchy sometimes. Stretch marks vary from your normal skin in color and texture and may appear on various body parts including your thighs, stomach, breasts, upper arms, hips, and back. Sudden and considerable change in weight and pregnancy are the most common causes of stretch marks. Rapid growth, stress, changes in physical condition and genetic factors may also lead to stretch marks. The key to preventing stretch marks is keeping your skin healthy and hydrated. There are various methods to help improve and maintain the elasticity of your skin, which also helps counteract stretch marks. Stretch marks can fade on their own, but it can take some time. There are a number of creams, lotions, and other products in the market that can help you get rid of these unwanted streaks quickly. 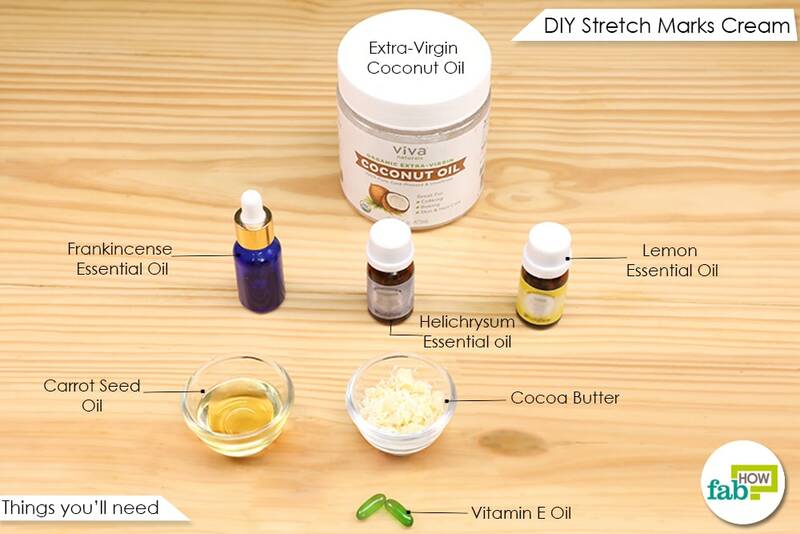 Another way to accelerate the disappearance of stretch marks is to make your very own homemade stretch marks cream. It is an easy, quick and safe way to heal your skin and keep it healthy. 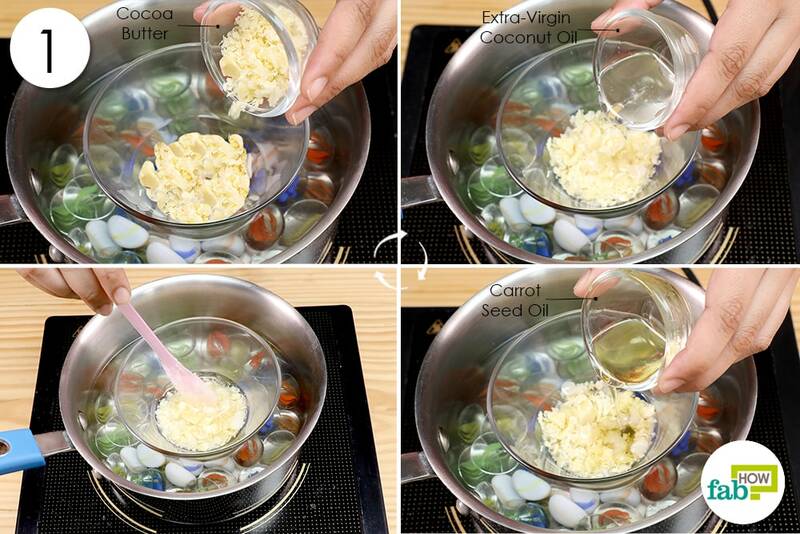 Prepare a double boiler and add 1 tablespoon of cocoa butter to it. Add 1 tablespoon each of coconut oil and carrot seed oil. Let the mixture heat up, while stirring frequently. 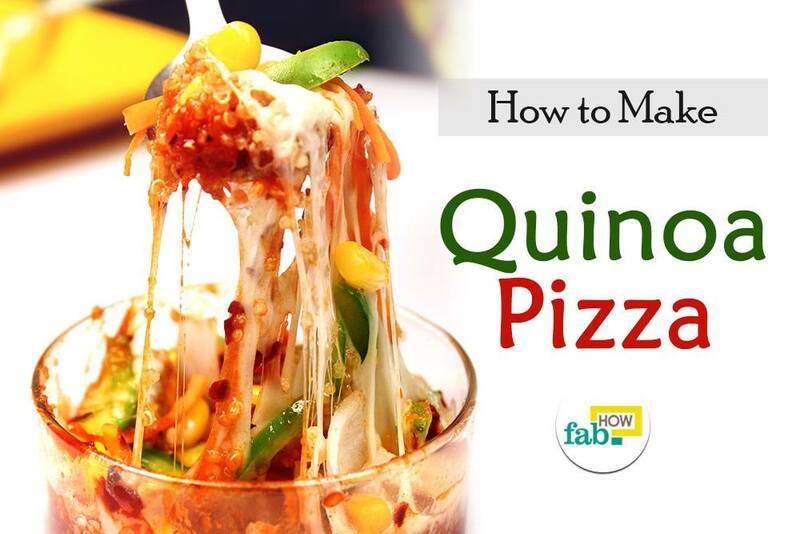 Remove the mixture from the heat once it has melted. Add 4 drops each of helichrysum and lemon essential oils to the mixture. 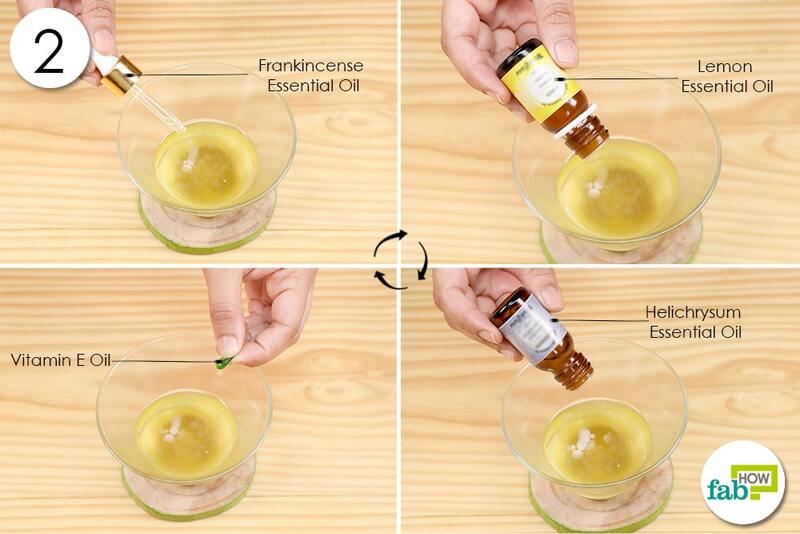 Add 2 drops of frankincense essential oil as well. Puncture 2 vitamin E capsules and squeeze the oil into the mix. The mixture will take on a cream-like form as it cools. Use an egg whisker to blend it into a smooth consistency. Transfer it into a container. 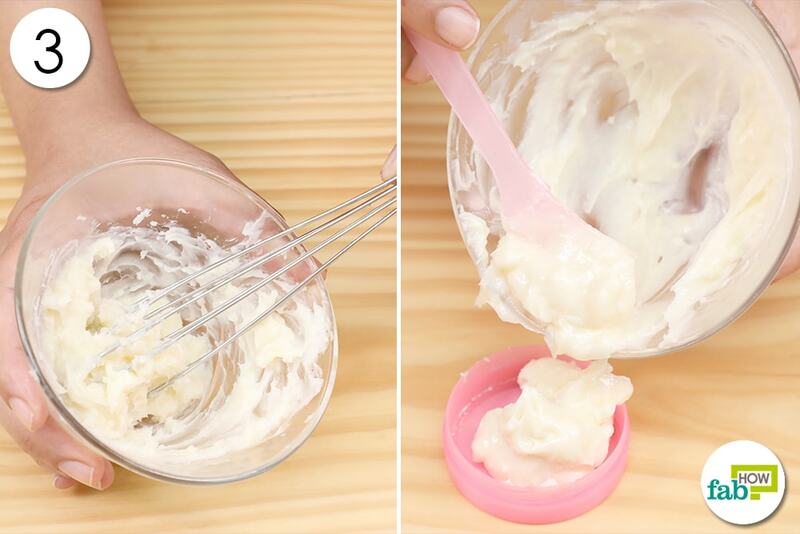 Store this DIY homemade stretch marks cream in a cool, dry place. Apply it before going to bed over the stretch marks and massage in circular motion for a minute. This homemade stretch marks cream will keep good up to 6 months. This easily absorbable ingredient moisturizes and repairs the skin, thus helping get rid of stretch marks. It can be used to lighten scars and improve the skin’s texture. Also, it is rich in antioxidants needed for healthy skin. Moreover, cocoa butter keeps the skin hydrated and protects it against damage. Its moisturizing and antioxidant benefits make it a suitable remedy for stretch marks. Coconut oil is absorbed deep into the skin. It fights free radicals and repairs and protects damaged skin. It prevents stretch marks by keeping the skin hydrated and elastic. 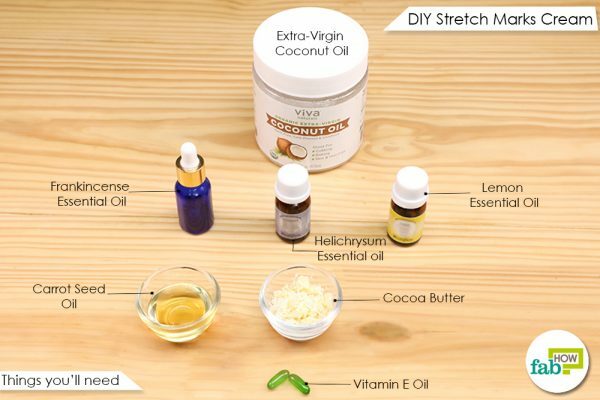 Since coconut oil has anti-inflammatory properties, it may accelerate the process of healing existing stretch marks. This oil will effectively improve the health and appearance of your skin. Carrot Seed oil: This natural powerhouse of nutrients and antioxidants helps tackle various skin issues, including stretch marks. It’ll give you smooth and supple skin by locking in the moisture and nourishing the skin. It strengthens the skin, nourishes it and helps diminish existing stretch marks. Its antioxidant properties help protect the collagen fibers from free-radical damage, keeping the skin elastic and less prone to stretch marks. It is best to use vitamin E oil from the early stages of pregnancy. Foods rich in vitamin E and supplements can also be immensely effective in keeping your skin smooth and free from these unsightly marks. Consult your doctor before taking supplements. Essential oils: Essential oils have become a common ingredient in beauty and skin care solutions. From commercial products to home remedies, they are used everywhere! 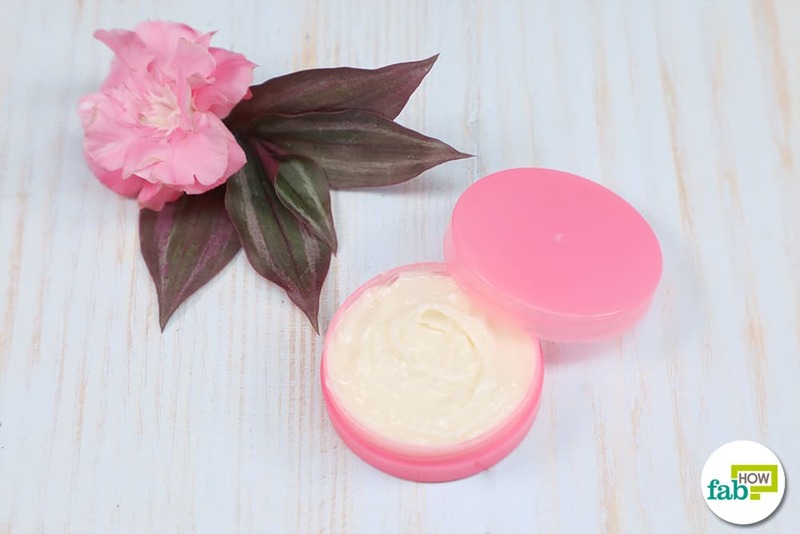 Helichrysum, frankincense and lemon essential oils will not only provide additional skin care benefits, but they will also give your DIY cream a pleasant and refreshing fragrance. Lemon essential oil also has antibacterial, antiviral, antiseptic and astringent properties. Rich in antioxidants and vitamins, this oil can work wonders for the dry and dull skin. It can help prevent stretch marks by boosting the health and hydration of the skin. It is also useful in lightening existing marks. Plus, lemon oil helps to increase the absorption of other ingredients. Frankincense oil can be applied topically for treating skin issues, such as minor burns, boils, acne, wrinkles, insect bites, scars, rashes, and cuts. It also helps keep the skin moisturized and has regenerative properties, which help reduce the appearance of stretch marks. For best results, begin treating the stretch marks as early as possible. Apply an oil (like coconut, carrot or castor oil) or oil blends to improve your skin’s elasticity. Prolonged use of corticosteroids should be avoided. Scratching the stretch marks may make the problem worse. Prevent stretch marks during pregnancy by keeping your skin moisturized, exercising regularly and keeping yourself hydrated. A nutritious diet will also help. Foods containing antioxidants, vitamins (especially E and A) and omega-3 fatty acids are great for your skin. Brennan M, Clarke M, Devane D. The use of anti stretch marks’ products by women in pregnancy: a descriptive, cross-sectional survey. BMC Pregnancy and Childbirth. https://www.ncbi.nlm.nih.gov/pmc/articles/PMC5031338/. Published 2016. Lin T-K, Zhong L, Santiago JL. Anti-Inflammatory and Skin Barrier Repair Effects of Topical Application of Some Plant Oils. International Journal of Molecular Sciences. https://www.ncbi.nlm.nih.gov/pmc/articles/PMC5796020/. Published January 2018. Singh S, Lohani A, Mishra AK, Verma A. Formulation and evaluation of carrot seed oil-based cosmetic emulsions. Journal of cosmetic and laser therapy : official publication of the European Society for Laser Dermatology. https://www.ncbi.nlm.nih.gov/pubmed/29737890. Published May 2018. Keen MA, Hassan I. Vitamin E in dermatology. Indian Dermatology Online Journal. https://www.ncbi.nlm.nih.gov/pmc/articles/PMC4976416/. Published 2016. Orchard A, Vuuren Svan. Commercial Essential Oils as Potential Antimicrobials to Treat Skin Diseases. Evidence-based Complementary and Alternative Medicine : eCAM. https://www.ncbi.nlm.nih.gov/pmc/articles/PMC5435909/. Published 2017.